What will 3G mean to you? With the foray of 3G or third generation in India, Mobile users will be able to watch TV, read mobile magazines, watch video clips, make video calls, browse and download at much higher speeds, all these would be in addition to the already existing services available on mobile devices. Despite the delay in the introduction of 3G and the controversy surrounding the spectrum-allocation, mobile companies and millions of subscribers are looking forward to the proposed 3G auction, which is expected to be held on Jan 14, 2010. This time the auction will include some international participants wishing to make an entry into the lucrative Indian market. Inline with the launch, not just Telecos but also Tech giants like HP, Google, Oracle have showed considerable interest in the run-up. HP has launched 4 new products and will sync with telecom providers for 3G services. Google is mulling participation in the auction through an Indian partner, in order to bid for the 3G bandwidth. While companies like Oracle are looking to become technology providers to various operators. So how does this exercise that involves such high-stakes (expected revenue around Rs 25,000) going to be held? Well, the DoT, or Department of Telecommunications, intends to carry out this exercise in 4 steps - bid invitation, pre-qualification, auction process and final grant of spectrum. At present the government has earmarked 200 Mhz of band frequencies between 900-1000 Mhz and 1800-1900 Mhz for 2G. For the additional 3G spectrum the government will allocate some of the space presently controlled by the India's defense forces. The additional spectrum of 30MHz to be sold in the auction will lie between 2100-2200 Mhz. - Spectrum-allocation winners would be required to pay 0.5% for the first 3 years and 1% thereafter. India having already witnessed a monumental growth in the Mobile market and with predictions of huge rise in the broadband penetration, you can expect 3G to not just tap the existing user base but also to make inroads into the 100 million first-time users over the next few years. 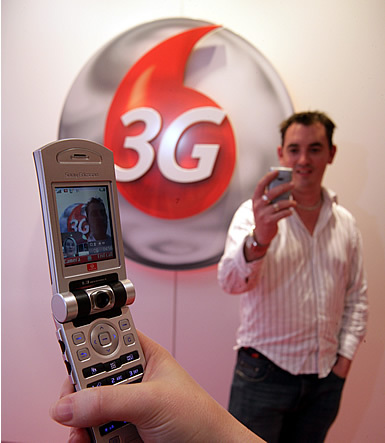 Until the auction, hold your breadth as 3G gets to unleash its prowess. Tags:News,Today News,3G in India,Technology news,Tech Bytes.